An attempt to divide the Slavic siblings of Russia and Ukraine on flimsy grounds, is part of a well-thought out Western strategy that has been in use even before the time of Julius Caesar. While doing a part-time course in the historic Tuscan city of Siena, I came across two intelligent classmates from Odessa, Ukraine. There’s nothing about the way they looked, spoke or behaved that even hinted that they weren’t Russians. They spoke Italian with a cute Russian accent, were as open and friendly as any girl one would across in Russia and yes, even at 8 am, they would be in class well-dressed and with their makeup on! Although I knew that the duo were from a city that is essentially Russian in character, I was surprised when they spoke to each other in Russian. They both claimed to be proud Ukrainians but could not speak the dominant language of their country as well as they could speak Russian. The girls, both born after 1990, said they spoke in Russian at home and were also educated in the language. They also had Russian surnames. So, where did the need come from to assert this Ukrainian identity, I asked. It was the hope of being a member of the EU and not needing a Schengen visa that made these two girls look firmly towards the West. The “prestigious” concept of European Union membership is the carrot that is being dangled at Ukrainians to turn their back on Russia and elect a government that is directly hostile to both the country and its language. Many Ukrainians have the same attitude towards Europe and the West that a large number of Russians had in the immediate aftermath of the collapse of the Soviet Union. This is some sort of false belief that the West is flowing with milk and honey. When told that many countries in southern Europe are struggling economically, the counter-argument is the next door neighbour is doing very well and Ukraine could become the next Poland. Ukrainians share the same culture and ethos as Russians and are generally not the pragmatic go-getters that many northern Europeans are. Those who think that Ukrainians would be warmly welcome into the European family of nations need to ask Lithuanians and Latvians who had expectations of living an ideal life in Sweden, how it is turning out. Or maybe just read the English press and find out about how the red carpet is being rolled out to Bulgarians and Romanians in the UK? Dividing and ruling over the Slavic siblings of Russia and Ukraine is in line with a well-practised and perfected strategy that goes back to the politics of ancient Greece. It was employed to perfection by the Western powers from the 19th century onwards when they colonised much of Africa and Asia. Before the advent of colonialism, passports, borders and identity cards did not exist in the two continents. Borders were drawn so arbitrarily by the colonisers that when they finally left, there was so much bloodshed and meaningless violence. The existence and prolongation of colonialism simply lay on this principle of divide and rule. The English followed this to the textbook in India and before leaving, convinced a large number of people that Hindus and Muslims were really different nations. The Brits did not even leave a small island like Ireland alone and divided the country on sectarian lines! The successor to the British Empire, the United States and its global network of vassal states have now set their sights firmly on Russia’s neighbourhood. A glance at rightwing Western commentary is enough to convince the most neutral of observers that the “grand plan” is make Ukraine join NATO and then falsely prop up the economy of the country and employ as many tactics as possible to create mass revolts and unrest in Russia, to bring it back to what it was in the Boris Yeltsin days. This is a bizarre and laughable scenario but essentially those who spend $5 billion in a coup in Kiev think it is possible to further their neo-liberal agenda and subjugate Russia. The West is essentially looking to meet its goals by creating a false sense of enmity between Russians and Ukrainians. If the people of Ukraine really want to be a part of the failing experiment that is the EU, then it is their choice. If a large number of people in the country don’t realise that the global centre of power and wealth is shifting from West to East, and are looking at short-term immediate gains, then so be it. But they need to keep in mind that Russians genuinely have a sense of brotherly warmth for Ukraine. Even the IMF chief admitted this week that Ukraine’s economy would have collapsed without Russian help. As a potential member of the EU, Ukraine would resemble a so-called PIGS country than Poland, given the present state of affairs. But the Western propaganda campaign in western Ukraine and Kiev is designed in a way that the Ukrainians can simply not see that they are pawns in a larger game. 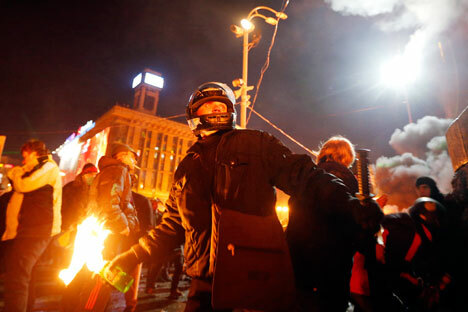 It’s up to Ukraine to call the bluff of the Western divide and rule policy. However, no matter what happens in Ukraine, Russia will not allow it to become a member of the biggest anti-Russian military alliance in the world, NATO.